The project by Lilyana Karadjova and Dimitar Stoyanovich is motivated by the deficit in understanding of freedom among the broader Bulgarian public. The living existential and original sense of Freedom Here-and-Now has been lost in the scale of the notion, banalized in economic and legal texts, and degraded in political populism. Freedom has become and abstract and rigid word, devoid of explicit meaning, distant from the daily issues of the ordinary person. A key factor that defines this situation is the limited understanding of freedom, which exists as a residual concept from the 19th and 20th centuries. This is the ideal of the Bulgarian revival toward collective freedom from Ottoman rule, continued through the Communist regime as a quest for freedom from ideological repression. There is a lack of intuition and understanding of the personal and positive manifestations of freedom in the broad public attitudes. The phrase “Here and Now” has degraded in the entertainment industry, which is why Stoyanovich and Karadjova express the existential vertex of the human reality in a philosophical manner – here and now. Dimitar Stoyanovich is a historian, playwright, Editor-in-Chief of L’Europeo Magazine since 2013, and Lilyana Karadjova is a photographer, Doctor of Philosophy in Art History, lecturer at the National Academy of Arts and the New Bulgarian University and a long-standing author for L’Europeo. 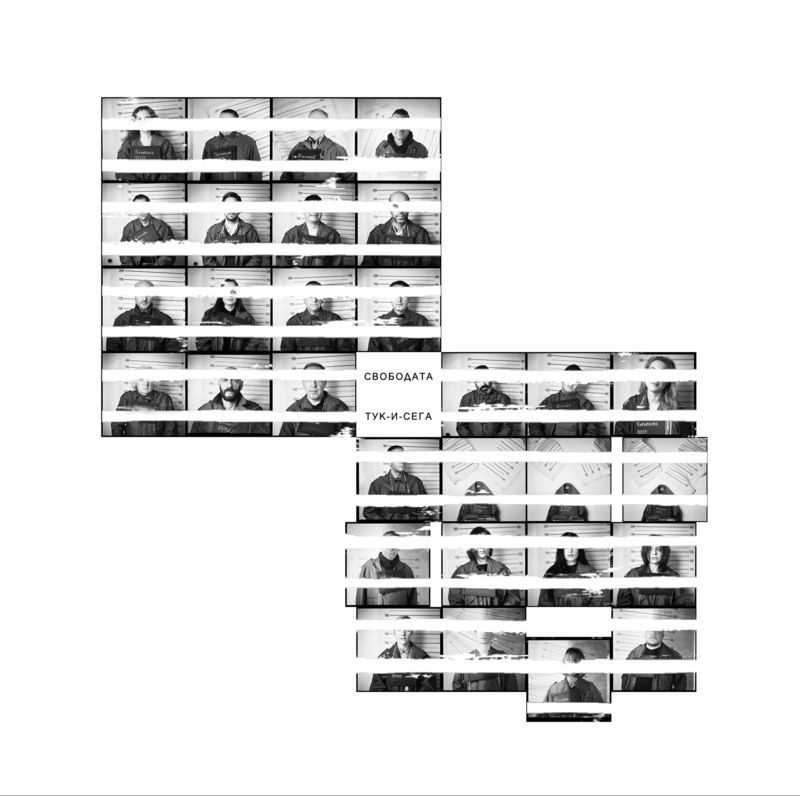 black and white negative film 120 inspired by the popular mugshots of the 1960s and 1970s, a period that was marked by the strong resonance of social messages in the public space. The square of the medium format and frame borders serve as a grid that closes the intellectuals in their own images, from which they release themselves by signing the portraits and taking over the position of the author and photographer. Instead of using a signature, the authors identify themselves with a text devoted to their personal freedom here-and-now. In the photographic installation, the photos are copied in a 130 x 100 cm format and are exposed hanging on film-drying clips, emphasizing the role of film emulsion in a more explicit message. Co-authors Lilyana Karadjova and Dimitar Stoyanovich follow the common belief that photographic film has the extraordinary potential to reveal the psychological intensity in portraits, not only by giving the specificity of its emulsion but also through the accidental and freely emerging details that are very limited in digital photography. The authors have deliberately included photos with similar elements that mark the freedom in photography as coming with human error: a broken film, an accentuated, double-exposed shot, four portraits from a not fully developed film due to "squeezed air" in a full dose and a strange graying texture on the back of the polyester tape, a defect of unclear origins. Human error is an artistically developed visual code of freedom. The photographic book "Freedom Here-and-Now" is a unique piece of art sized 59x42x8 cm, with copies of the portraits with a manually applied silver-gelatin emulsion on handmade paper, again signed by the authors. At every level of its creation, the photobook is filled with unpredictable and invisible tremors of the hand, human imperfection and human mistakes. With the turning of every page, a photographically structured black square breaks down into a negative and positive under which the signatures are seen containing freedom here-and-now. One of the peculiarities of the mugshots is the psychological intensity resulting from an emergency situation. Looking at archives of mugshots, co-authors Lilyana Karadjova and Dimitar Stoyanovich discover a wide variety of emotional states including smiling faces such as that of James Hall, who was arrested in Newcastle on 19 August 1944. That's why the participants in the project were given a choice in the way, in which to express their own arrest.